Authors: Nikolov, D. K. Sing, J. J. Fortney, et al. The field of Exoplanetary science, the study of planets orbiting stars other than the Sun, is a relatively new and exciting area of Astrophysics. Ever since the first detection of an extrasolar planet, 51 Peg b, scientists have made rapid progress in the discovery of these new worlds, with over 3900 confirmed exoplanets found to date. More recently we have moved beyond mere discovery and have begun to investigate the chemical composition, physical processes and evolutionary histories of exoplanetary atmospheres. One major hurdle in the interpretation of these observations is the presence of clouds and hazes which act to weaken or even completely obscure atmospheric features. Now, for the first time, astronomers have discovered an exoplanet that appears to be completely cloud-free, marking a significant step forward in attempts to characterise new worlds beyond our solar system. Figure 1: Artists impression of the cloud-free ‘hot Saturn’ exoplanet WASP-96b. The blue colouration is due to sodium absorption in the planet’s atmosphere. Image credit: Engine House. WASP-96b is an inflated ‘hot Saturn’ with a mass roughly similar to Saturn but a radius about 20% larger than Jupiter. It periodically transits a Sun-like star around 980 light years away in the southern constellation Phoenix and due to its proximity to its host star has a searing temperature of 1300K. Its extended atmosphere means that it provides an excellent target for atmospheric characterisation studies. An international team, led by Dr Nikolay Nikolov from the University of Exeter, observed the atmosphere of WASP-96b as it transited its host star using the FORS2 spectrograph mounted on the 8.2-metre ‘Very Large Telescope’ in Chile. During a transit event a planet blocks a fraction of the light from the host star the observer would otherwise receive and hence the star is seen to dip in brightness periodically. 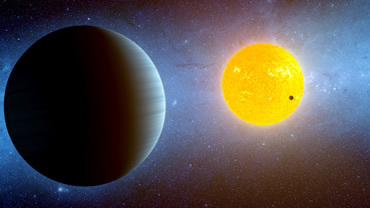 These events allow astronomers to use the technique of transmission spectroscopy to probe the atmospheres of exoplanets. The technique itself is relatively straightforward; as a planet crosses the disc of a star a small amount of the star’s light will pass through the atmosphere of the planet at its day-night boundary allowing atomic and molecular species residing in the planet’s atmosphere to absorb some of the incident photons. This absorption leads to an apparent variation in planetary radius as a function of wavelength and is known as a transmission spectrum. By studying the features of these spectra astronomers can begin to tease out details of the planet’s atmospheric composition. Clouds and hazes are common throughout the planets of the solar system and have also been observed in the atmospheres of multiple exoplanets. Although sometimes treated as being essentially the same phenomena clouds refer to condensates of atmospheric constituents whilst hazes are composed of smaller, photochemically produced particulates suspended in the atmosphere. Figure 2 shows how the presence of clouds or hazes in sufficient quantities in an exoplanetary atmosphere can weaken or completely block the absorption spectrum resulting in muted or featureless transmission spectra. Figure 2: Example spectra comparing the full spectral profile of sodium expected for a cloud-free atmosphere (left panel) to the attenuated profile expected and commonly observed in cloudy atmospheres (right panel). Image credit: N. Nikolov/E. de Mooij. The strength of water vapour absorption for a range of hot Jupiter atmospheres has also been shown to correlate with the difference in planetary radius at optical and infrared wavelengths, suggesting that clouds and hazes are the cause of the weakened spectral features. Clouds and hazes therefore contribute a major uncertainty to the prediction of atmospheric properties such as radiation transport, atmospheric chemistry, surface temperature and possibly even habitability. Just as humans can be uniquely identified by their fingerprints, so too can atoms and molecules be identified by their unique spectral characteristics. This has long been a powerful principle in observational astronomy, allowing the detection of various species in a range of celestial objects such as distant stars and the planets of our own solar system. Predictions have previously shown that absorption signatures from alkali metals such as sodium and potassium should be readily detectable in the atmospheres of hot gas-giants but so far observations have only revealed the narrow peaks of these features and not the full ‘tent-shaped’ profiles. This is because clouds and hazes tend to get in the way, obscuring the full profile which can only be produced deep in the planetary atmosphere. After comparing the atmospheres of over twenty exoplanets the team found that WASP-96b was the only one that showed a complete, pressure-broadened sodium absorption feature. Figure 3 shows the FORS2 observations for the two grisms (blue and red filled circles) compared to clear, cloudy and hazy atmospheric models at solar abundance (continuous lines). The observed data is in good agreement with cloud-free models whilst models incorporating clouds and hazes (magenta and blue) predict much smaller and narrower absorption features. The observations therefore strongly suggest an atmosphere free of clouds. The precise shape of the sodium feature also allowed the researchers to determine the absolute sodium abundance and to estimate the planetary metallicity finding that the latter was consistent with the mass-metallicity trend observed for solar system planets. Figure 3: Transmission spectrum of WASP-96b showing the broad sodium feature and comparison between the observed relative radius measurements with error bars (blue and red filled circles) and a selection of clear, cloudy and hazy atmospheric models (solid lines). The best fit models favour a clear atmosphere. Extended Data Figure 5 in the paper. The teams observations, covering the full range of cloudy to cloud-free atmospheres will help astronomers shed light on the compositions of these clouds and demonstrates the important role ground-based instruments can continue to play in the future. With the clearest atmosphere observed to date WASP-96b offers a benchmark for future characterisation studies and further observations with Hubble, the upcoming James Webb Space Telescope and other ground-based telescopes might also yield abundances of additional molecules such as water along with a precise metallicity determination. Such measurements would help put constraints on gas-giant formation mechanisms. I am a PhD student at the Astrophysics Research Centre, Queen's University Belfast. My work focuses on the characterisation of exoplanet atmospheres in order to better understand their chemical compositions, formation conditions and evolutionary histories. When not doing science I can usually be found playing drums and touring with my band.